Apollo 11 landed at 20:17 GMT on 20/07/69. 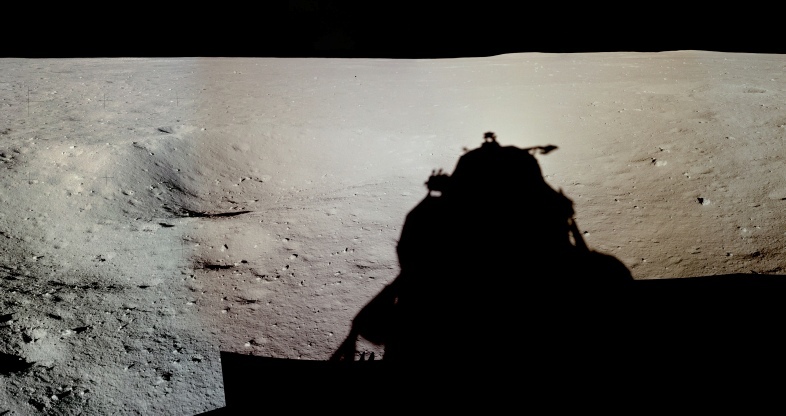 After completing all their post-landing system checks Armstrong and Aldrin took a series of photographs from the lunar module window, so that if they had to head back to orbit in a hurry then they at least had some pictures to show for the trip. While we don’t have a precise time for these pictures, the ALSJ estimate that these photographs were taken about 75-90 minutes after landing, based on their progression through a series of surface checklists (see here) relayed to Houston. Let’s put it at 21:30 for the sake of simplicity. These pre-EVA images can be found compiled into a panorama here, a cropped version of which can be seen below. 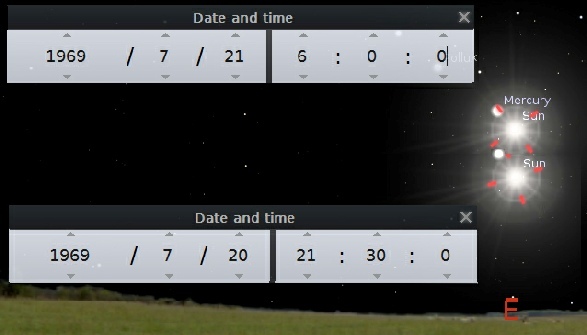 We also have a post-EVA set from the same window, which are recorded as being taken at between 05:50 - 06:00 on the 21st. A cropped version of that one is show below. The numbers on that image refer to the source photographs, and I’ve included the flag for good measure. So, we have two photographs separated by almost 10 hours, can we see any difference in the shadow length? Here’s an overlay of the shadow of the top of the lunar module. 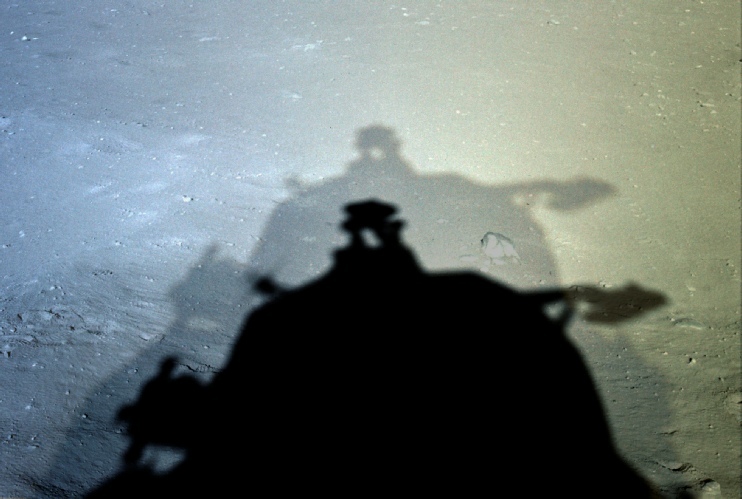 Well now there’s a thing - a very obvious difference in the position of the shadows before and after the EVA, with the shadow getting shorter as the sun rises in the lunar sky! Is it, however, what we would expect? If we put the photography times into Stellarium, we get a sun angle of around 11.5 degrees and 15.75 degrees for the pre- and post-EVA sessions respectively, which corresponds well with those given in the ALSJ for sun angles at the start and end of the EVA. Here’s a composite view from Stellarium. These sun angles should convert to shadow lengths of 34.41 and 24.82 metres respectively. What we can do now is compare those calculated line lengths with what we find on the ground. We have good LRO images of the site, and we can overlay those images in Google Moon, which will allow us to get a reasonably accurate measurement of the length of the shadows based on where the very end of the shadow falls on the Apollo photographs. The image below left shows that comparison, and is compared with a diagram from the Preliminary Scientific Report. 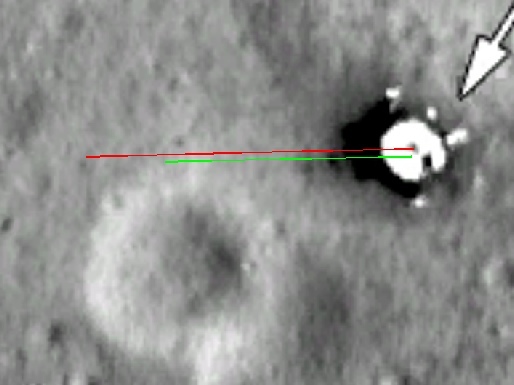 The red line in Google Moon is 27.2 metres long, and the green one is 20.2 metres. Erm..hang on though this is some way short of what the shadow length calculator gives, so what’s going on here? Well, the answer is in the assumptions that we made when calculating the line length, namely that we were on a level surface. 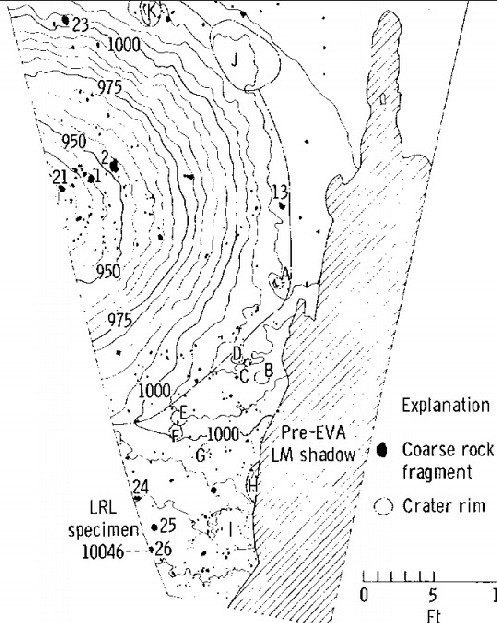 If the LM shadow is photographed looking uphill, then this will make the shadow seem shorter. Added to this the fact that the LM will be presenting a shorter profile to the sun and the shadow is likely to be much shorter. Let me illustrate it. In the example below I’ve placed 5 LM’s end to end and put a marker just short of the end of the last one to illustrate 34 metres. The protractor shows that this gives a sun angle from the top of the 7 m high LM of around 11 degrees. Now let’s move the protractor back to around 27 metres, just short of 4 LM lengths, and keep the same protractor angle. As we can see, it doesn’t take much of a slope to make the shadow appear considerably shorter. 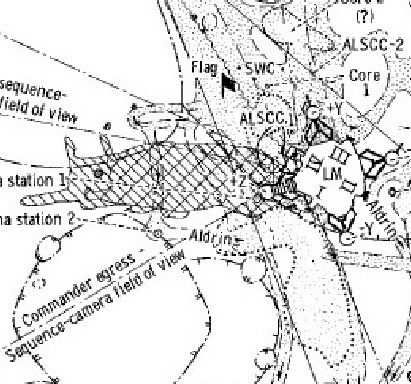 So, the question we have to ask now is: is the LM sat on a slope? Let’s have a look at a couple of photographs taken during the EVA and see. 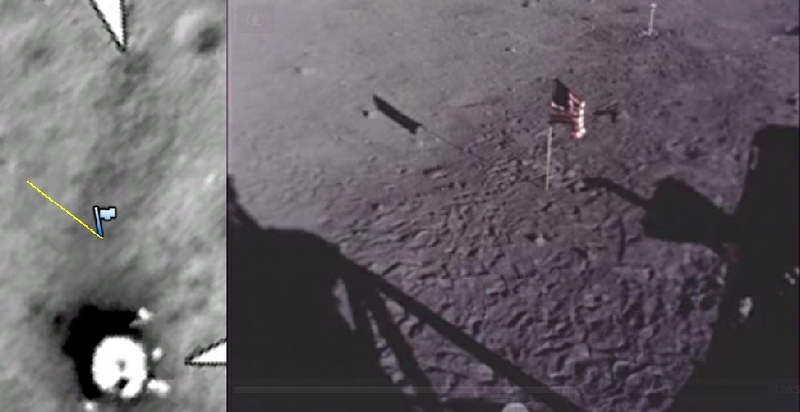 To be fair, it’s not the most reliable of indicators as lenses and the actions of the photographer can introduce all manner of distortions, but the image on the left (AS11-40-5931) does seem to indicate that the ground is sloping upwards away from the LM, and the famous photograph of Buzz at the flag (AS11-40-5874) seems to show the shadow on upward sloping ground (when compared with the horizon), We also have this map produced for the Preliminary Science Report using photogrammetry of images taken inside the LM, where the lowest contour line visible near the LM is 985 cm and the highest near the end of the shadow is 1025 cm. We are looking at potentially a 40-50cm rise in elevation over the entire length of the shadow. Still photographs are not the only evidence of shadow movement over time, we also have the footage taken of the area around the flag by the 16mm DAC camera mounted in the LM window (see here). We have two things we can look at here, namely the shadow of the LM itself over the period of filming, and also the shadow of the flag. Let’s see how the LM shadow compares by overlaying frames from near the start and end of the EVA. In this case Armstrong is present at the start, but not at the end. The image above is not at the start of the EVA, but some way into it. 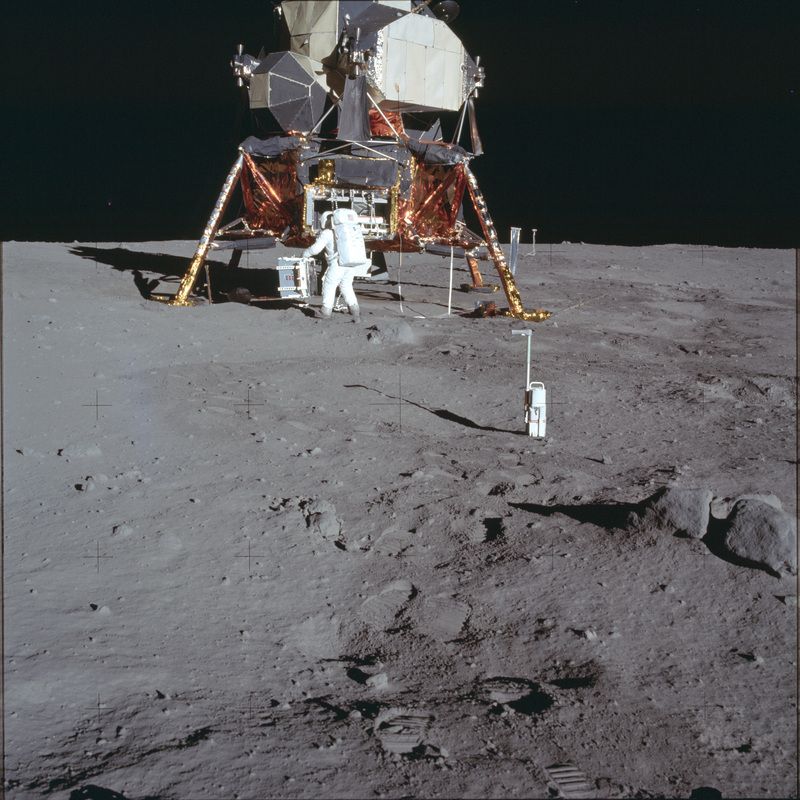 Aldrin has re-set the camera position several times before heading towards the outside himself, and Armstrong has just completed the collection of the contingency sample. For the record, although we can’t see the end of the LM shadow, this would put time at around 03:10 on the 21st, with a sun angle of 14.25 degrees and an LM shadow length on a level surface of 27.56 metres. On the left of the image we can see that there has been appreciable movement of the shadow as the EVA progressed an the sun climbs higher. The footage ends with movement reflected in the window but only moments after movement is visible outside, so it would seem likely that it is stopped by Aldrin after he returned to the LM just after 05:00. The sun angle a this point is 15.25 degrees. Can we tell anything similar from the flag shadow? Well, yes we can, but it’s difficult to tell with a simple overlay, so here’s an animated gif. It would be nice to be absolutely certain about the shadow length here, especially as the area of ground covered means that slope is less likely to be an issue (even though the pole shadow is shows at least one slope break along its length. The main thing stopping us here is uncertainty about the exposed length of the pole. 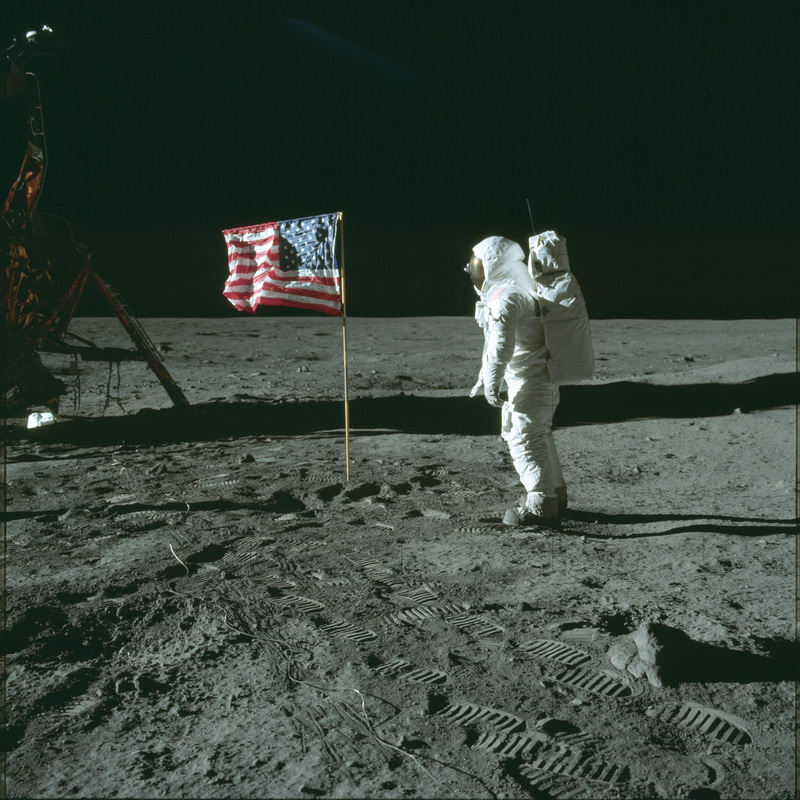 As described in this article, the total length of the poles used is given as 7’8” for Apollo 11, although this may not include a 4” connecting tube for the two 4’ poles. We have a metric length, therefore, of either 2.34m or 2.44m. However, a substantial portion of this is supposed to be buried in the soil, with a red line at 18” (0.46 m) as a maximum insertion depth. The actual insertion depth was usually 6-8” (up to 0.2m)/ Close examination of the Apollo 11 flag photos does not reveal such a red line, but it is evidently quite tall - Aldrin is 1.78 m before he puts on his boots and helmet, and even though he is nearer the camera than the flag it still towers over him. We can hazard a guess though. Let’s take go for a measurement of 7 feet, or 2.14 metres. This would allow for about 8 inches if penetration (stop tittering), which coincides with the 6-9 inches reported by the crew, and a 7’8” pole. Granted it’s all back of an envelope stuff, but it’s still a good match for what you would expect. 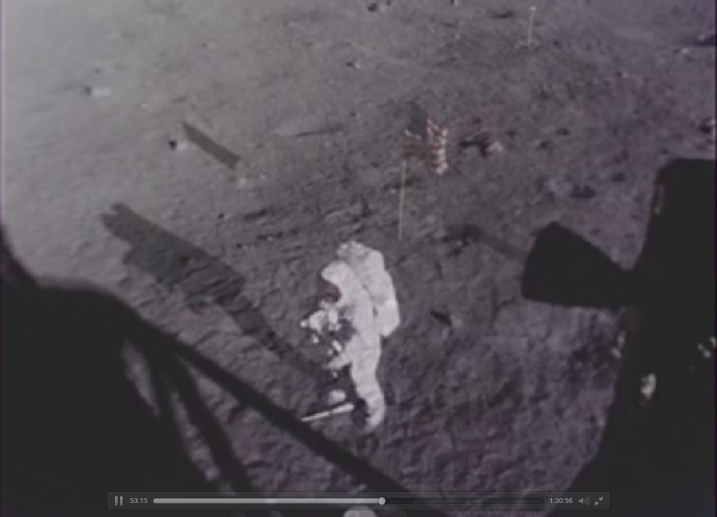 So here we have Apollo 11 photographs and video that show shadow lengths entirely consistent with both the time of the mission and the length of the mission. No multiple shadows either. This is because we went to the moon.